If you cherish exceptionally good organization or a touch of formality in your garden, ‘Morris Midget’ boxwood is a dream come true. 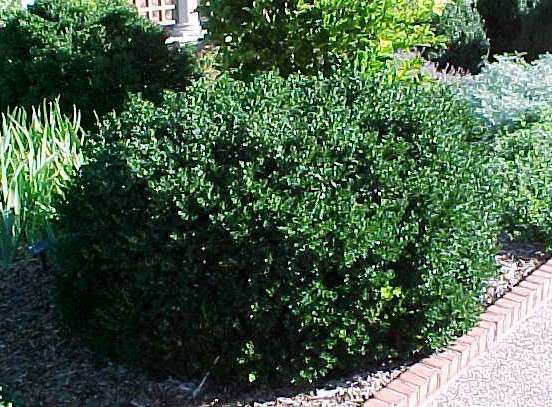 Its slow growth rate, mature height of 1 foot and mature spread of 1.5 feet make it an ideal candidate for low, bed-defining hedges. These same characteristics also mean you will seldom need to shear the hedge in order to keep it well shaped. 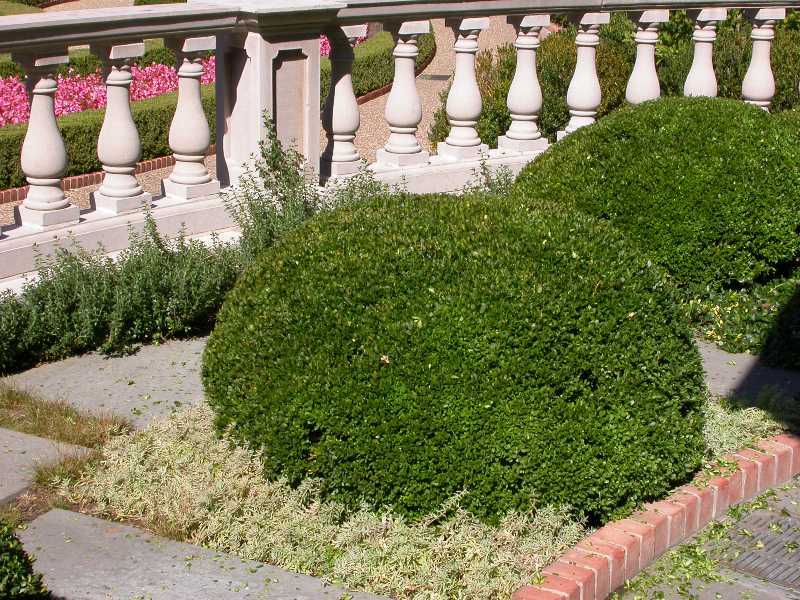 This is not to say that this boxwood cannot be planted as an individual specimen, or placed several feet apart at the front of a garden border. Planted individually it will provide a specific location in the garden with a small spot of evergreen color, hopefully a spot from which it is easily viewed. And spacing it at intervals along the front of a border will lend a nice sense of continuity and cohesiveness to beds and borders. There are aesthetic and physical characteristics of ‘Vardar Valley’ boxwood that make it a very valuable addition to your garden. First, its form is somewhat flat-topped and almost twice as wide as it is tall. This gives it a very “solid” look in the garden, offering the illusion of an “anchor” that firmly holds everything in place and together. Second, the new spring growth has a distinct blue-green color that contrasts nicely to the darker color of mature foliage. This two-toned effect is a nice counterpoint to the brighter green of other plants' new spring growth. Third, ‘Vardar Valley’ boxwood has proven to be more winter hardy than other English boxwoods. On the southern Great Plains, where winter temperatures vary wildly and winter foliage damage is common on broadleaf evergreens, ‘Vardar Valley’ typically survives with little or no damage. The same should be the case in St. Louis gardens. Nonetheless, it is still important to site this plant where it will be protected from prevailing winter winds. Make sure you read the PlantFinder entry for this holly, and pay special attention to the “Noteworthy Characteristics.” It makes fascinating reading and it gives special meaning to this species of broadleaf evergreen. Inkberry is not noted for its flowers or berries. Neither is very showy. But inkberry is a rock-solid broadleaf evergreen for St. Louis gardeners. It will always provide you with a warm spot of green in the winter garden. Cultivars of inkberry are usually better choices for most gardeners unless you have a large space to fill. ‘Compacta’ can reach 4-6 feet in diameter, and does so by putting up stolons from its root system. ‘Shamrock’ is less likely to stolonize, and will only spread to 4 feet. St. Louis gardeners will get best results if they water this plant every 12-14 days in the winter, as weather conditions permit. 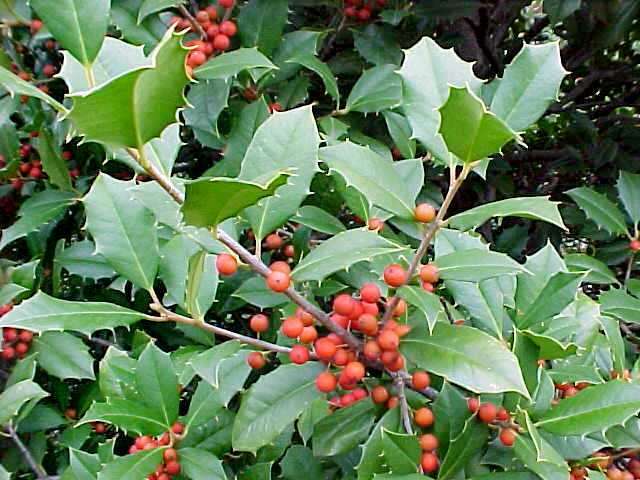 Fine public and private gardens throughout the Midwest and Northeast contain extraordinary specimens of this native holly. Its narrowly pyramidal form, good green foliage and lustrous red berries are a much loved symbol of the holiday season, as are the Christmas wreathes made from its branches. The best specimens are those that receive the best care. Whenever possible, water broadleaf evergreens every 12-14 days through the winter. This will help minimize leaf drop and prevent plants from looking “scraggly.” And watch out for iron chlorosis. Consult with your nurseryman for the right solution to this problem. It could mean feeding with iron sulfate or correcting the pH of your soil. 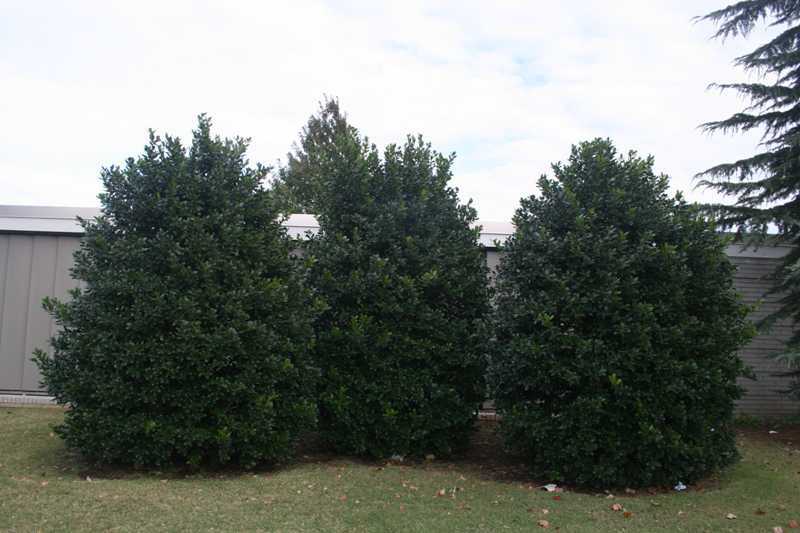 Four American holly cultivars are worth mentioning: ‘Canary’ is a pyramidal tree form that has yellow berries. This berry color sometimes stands out better in the landscape than the red-berried forms. ‘Clarendon’ is a spreading form that may well be better suited to “hedging” than its taller growing relatives. ‘Maryland Dwarf’ is an even lower growing spreading form that has great potential as a 3 foot tall groundcover. ‘W.M. Hawkins’ stays very small, making it a suitable candidate for those cute little hedges people like to border their entry walks with. Once upon a time plant hybridizers tried cross-pollinating very cold hardy, but somewhat ugly, hollies with not so hardy, but attractive, hollies. They hoped for a very cold hardy and very attractive holly. The pros did not succeed, but a backyard gardener named Mrs. F. Leighton Meserve succeeded admirably. Her efforts produced the “blue” hollies, so named because they have blue-green foliage. One of the best of the “blue” cultivars is called ‘Blue Princess’ holly. 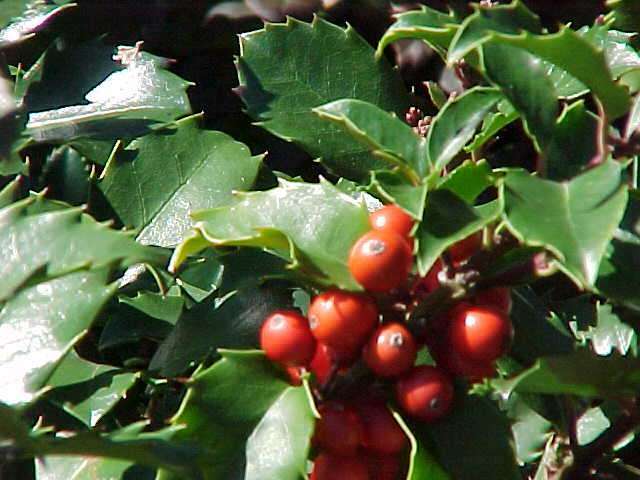 Its purplish stems and blue-green leaves create a holly with a broadly pyramidal form to 15 feet in height. If planted near a male blue holly, ‘Blue Princess’ will be adorned with bright red berries in late summer and fall. This wonderful cultivar allows St. Louis gardeners to have the kind of holly tree for which southern and southeastern gardens are famous. ‘Blue Princess’ also makes, with judicious pruning, an excellent smaller specimen or, planted in rows, a beautiful hedge. A variegated form, called ‘Honey Maid’, is available. It should be noted that while ‘Blue Princess’ is hardy to zone 4, ‘Honey Maid’ is hardy to zone 5. Both, however, are hardy in and suitable for St. Louis gardens. Winters can be devastating for broadleaf evergreens. 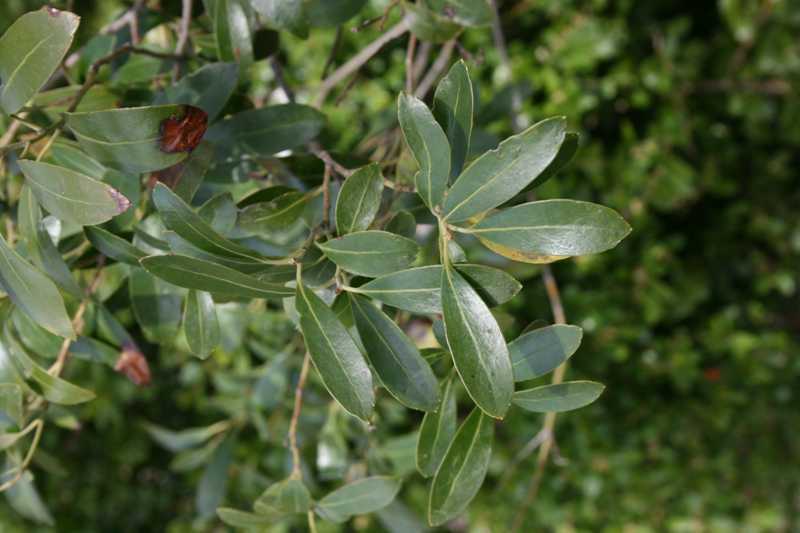 Foliage and stems can be discolored or damaged to such an extent that they simply die. Of the larger hollies, ‘Nellie Stevens’ has proven time and again to be among the hardiest of cultivars. After particularly harsh winters, when Chinese and English hollies have been damaged or have died with relentless regularity, ‘Nellie Stevens’ holly has waded through the devastation unharmed. Couple this with its attractive dark green, 2-3 spined leaves and abundant, large and bright red berries and you have a wonderfully pleasing broadleaf evergreen. ‘Nellie Stevens’ can be kept at a 4-6 foot height with seasonal pruning or it can develop unpruned into a broadly cone-shaped tree-form that eventually reaches 15-25 feet in height. Either way, it is a notable addition to any garden. Also of note is Ilex x meserveae 'Hackfee' CASTLE SPIRE. 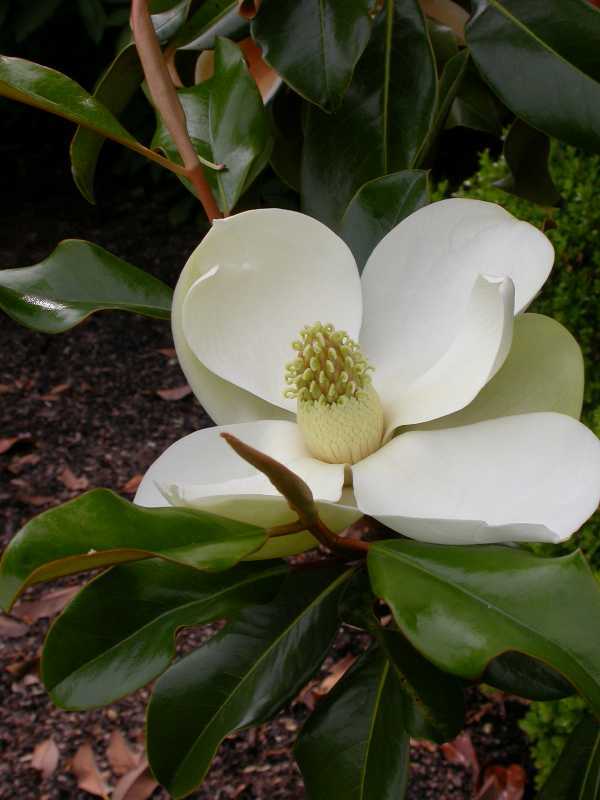 ‘Bracken’s Brown Beauty’ southern magnolia did not acquire its name because its foliage turns brown. Its name refers instead to a quality many magnolia lovers find very attractive. The underside of the leaves are coated with cinnamon-brown “indumentum”, or covering of fine hairs, that give this small tree distinct and very beautiful two-colored foliage. Its compact habit makes it suitable for garden positions in which other magnolias would look crowded or constrained. Its blooms are large and snowy white, with a fragrance that is almost unmatched in the plant kingdom. Heaviest bloom occurs in spring, but you can count on sporadic reblooms throughout the summer months. This southern magnolia is unique in that it is reliably hardy in St. Louis gardens. That said, it is still wise to site this plant in a place protected from prevailing winter winds. Of the evergreen azaleas the Girard series offers some of the hardiest choices. In southern Great Plains gardens, where foliage damage to azaleas is common, this series commonly wades through winter with hardly a scratch. Because they are hardy to zone 5, they will also perform very well in St. Louis gardens as long as you follow the cultural instructions on the PlantFinder page for 'Girard’s Rose’. Because they mature as pleasingly rounded 2 x 2 foot forms, they are well suited to small gardens. 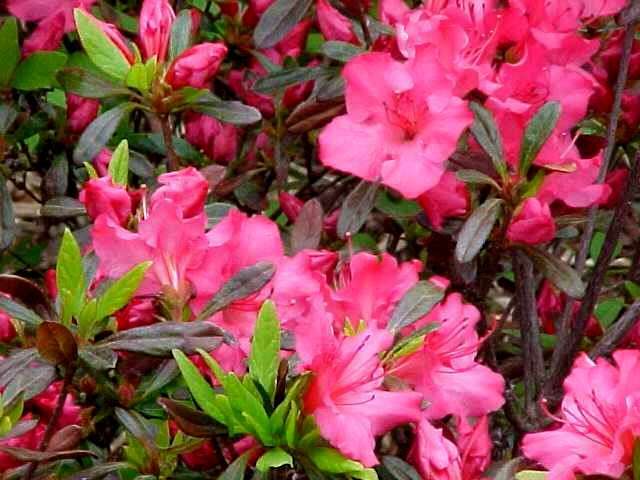 The evergreen azaleas commonly bloom in spring, producing clusters of large deep rose pink blooms that can, with good care, almost cover the plant. In mild growing seasons, some reblooms in September might occur. The image accompanying this text, taken in Oklahoma City on September 6, shows that rebloom, though not common, is possible. Rhododendrons, to borrow better authors' words, are “flamboyant in flower” and “spectacular in leaf.” They are a challenge to grow, making success all that much sweeter. Merely deciding to grow a rhododendron means you refuse to become a complacent gardener. 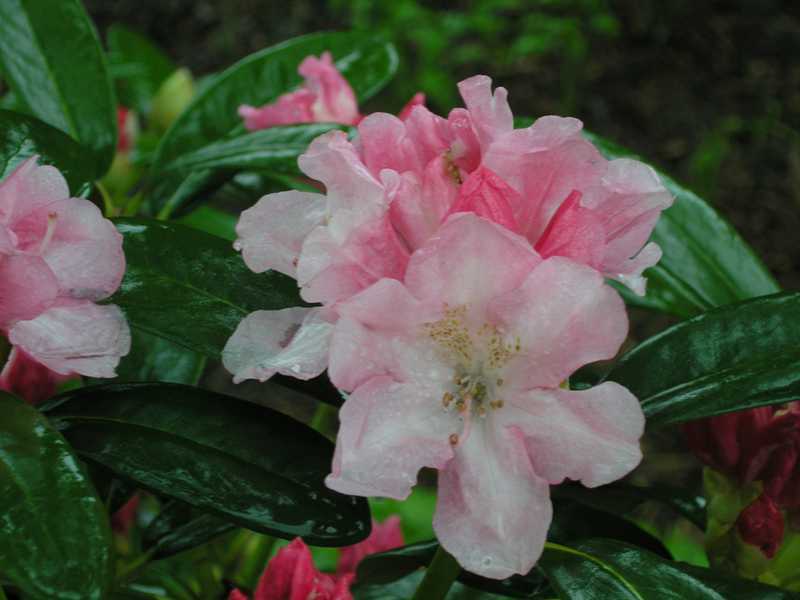 Read the PlantFinder pages for rhododendrons for excellent cultural instructions. One of the best “rhodos” to grow in St. Louis gardens is a very compact cultivar named ‘Mary Fleming.’ Its mature height and spread of 2.5 feet makes it an ideal candidate for small gardens or not-very-deep borders. Dark green leaves clothing its form become rich bronze during the winter months. ‘Mary Fleming’ produces large clusters of creamy yellow blooms accented with pink edges and tints in early spring. 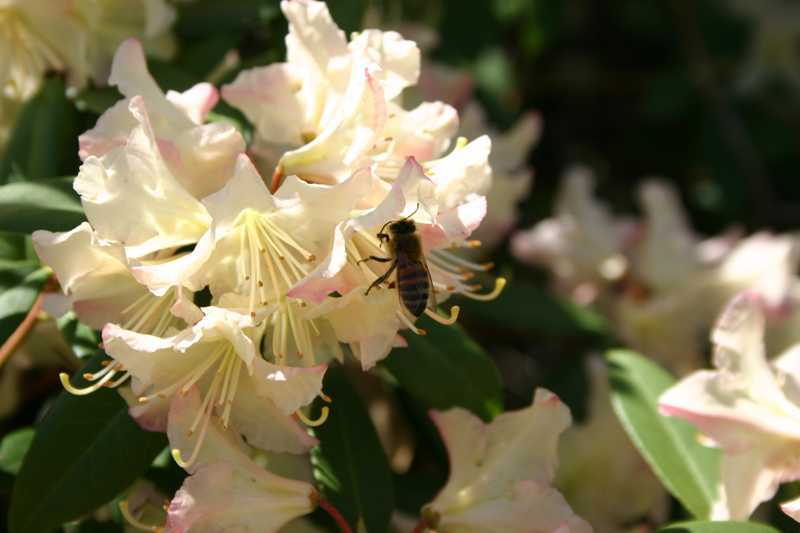 You could base a decision to plant ‘Yaku Prince’ rhododendron on nothing more than its hardiness to zone 4 and, therefore, its survivability in St. Louis gardens. But that, of course, ignores the best reasons for its use. ‘Yaku Prince’ is a drop-dead beautiful broadleaf evergreen. The large, dark green leaves clothe a form that is pleasingly rounded and 2-3 feet high and wide, perfectly suited to small as well as large gardens. The blooms are simply spectacular. They appear in spring in large 4-6 inch clusters and are strikingly bi-colored pink and white. Click on the name above; read about this plant for detailed cultural instructions; then run right out and get one. You will be dazzled by the results. 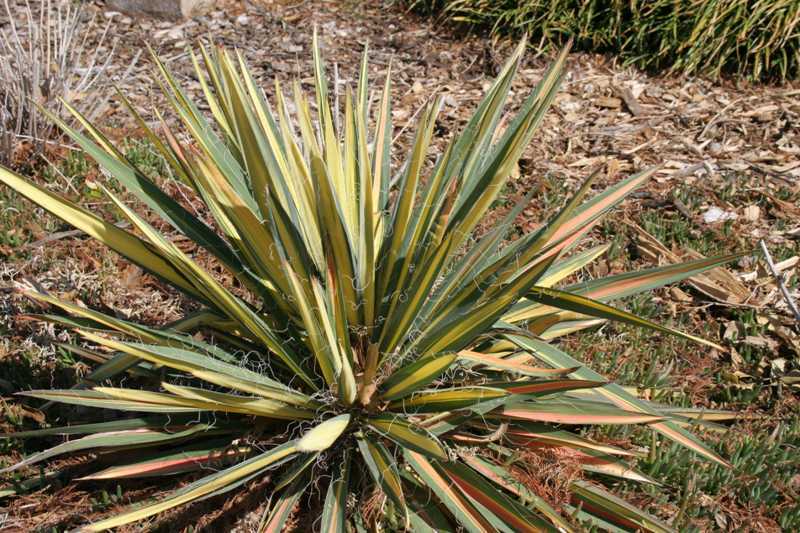 Yuccas might be thought of as more suited to southwestern gardens than to gardens in the Midwest. But ignoring it on those grounds discounts a plant that makes unique contributions to any garden in which it appears. For instance, in a cactus and succulent garden it is simply one of many spiky forms. But in a temperate climate garden, surrounded by the fine foliage of conifers and the broad leaves of flowering shrubs and perennials, it is a stand-alone knockout. Its rosette of green and bright gold leaves makes a unique “focal point” at the front of any garden border throughout the growing season as well as most winters. And the flowers are simply stunning. They appear in panicles on a strong stalk emerging from the center of each rosette and reaching a height of 5-6 feet. The flowers are creamy white, nodding, and enticingly fragrant. Plant this singular specimen in well-drained soil and full sun, but protect it from prevailing winter winds. And consider planting it in an asymmetrical grouping of three plants to make a strong statement even stronger.